Turning Tables – Qualification. Career. Integration. 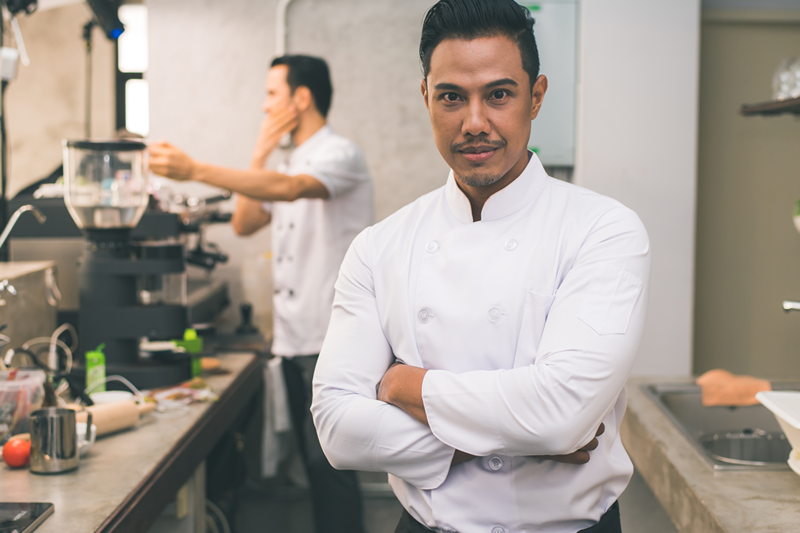 Turning Tables is a social start-up that delivers tailored programs to connect and qualify refugees in need of jobs with members of the gastronomy and hospitality sectors that need long-term, skilled employees. Update March 2019: Despite our successful 13 programs with 150 participants so far, we are currently unable to offer new qualification programs due to lack of funding. We will inform you about any changes as soon as possible. Thank you very much for your interest! We work closely with partners from the gastronomy and hospitality sectors. 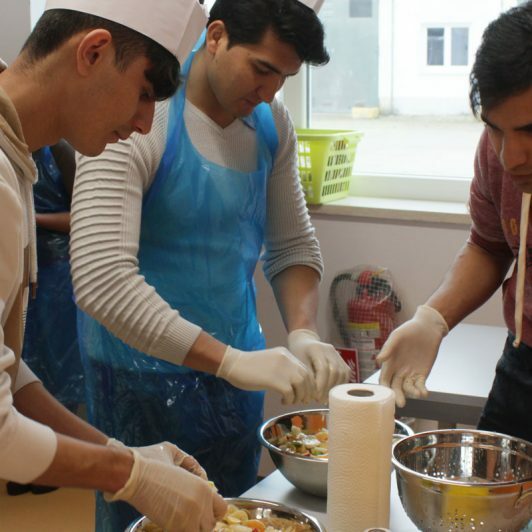 Turning Tables supports refugees to integrate in the German labour market and society through capacity building in the gastronomy and hospitality sectors. Before I did Turning Tables’ Step-IN program, I would have never believed that I could get to the point where I am now. I haven’t only found a great apprenticeship in an internationally known hotel, but also many new friends. Turning Tables has prepared me very well. Prior to the program I had no perception of work in the gastronomy industry. If I now have a job interview, I can claim to have learned and practised all the important things to a certain degree already. This helped a lot: I now have an apprenticeship as a hotel specialist. The Turning Tables Team is very friendly and nice. They helped me a lot. Now I have an apprenticeship that I really like. Turning Tables has dramatically changed my life. Before the Step-IN program I didn’t have much and now I have everything I want: work, school, friends and a future. I like to be an intern at Turning Tables, as we contribute an important part to the sustainable integration of refugees. At Turning Tables it is not about high numbers of participants, but satisfied participants and the high quality of each gastronomy course. Doing my internship at Turning Tables was the best decision. As an intern, you are taken seriously and can contribute to something meaningful that can really make a change in other people’s lives. The team is incredibly committed – absolutely inspiring. Being part of Turning Tables means a lot to me, as I can support young refugees to settle down and build up a new and successful life in their new home. I greatly enjoy giving participants an insight into the life of gastronomy and thereby enable them to start work or an apprenticeship prepared. I am part of Turning Tables because I have experienced the successes of the first workshops and the positive effects for the participants themselves. It's nice to be able to sustainably improve their situation. 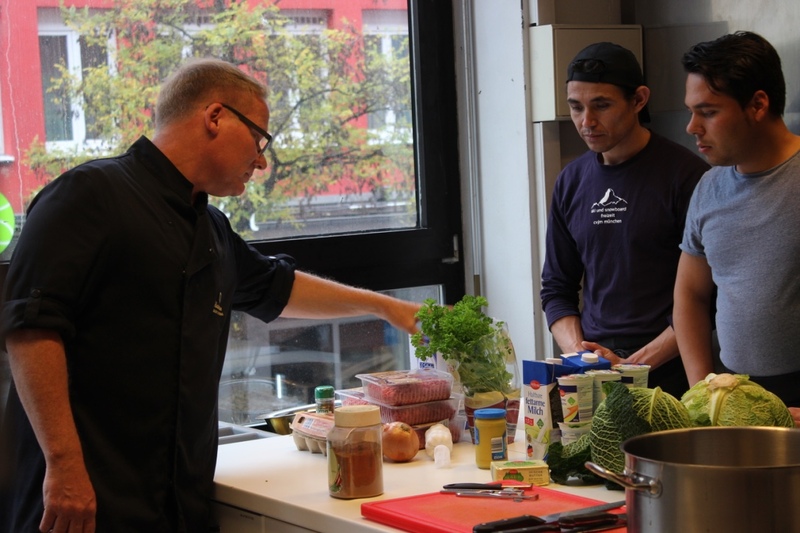 With over 5000 refugees looking for a job in Munich, Turning Tables’ mission to help refugees integrate by preparing them for the gastronomy sector is becoming more and more relevant. 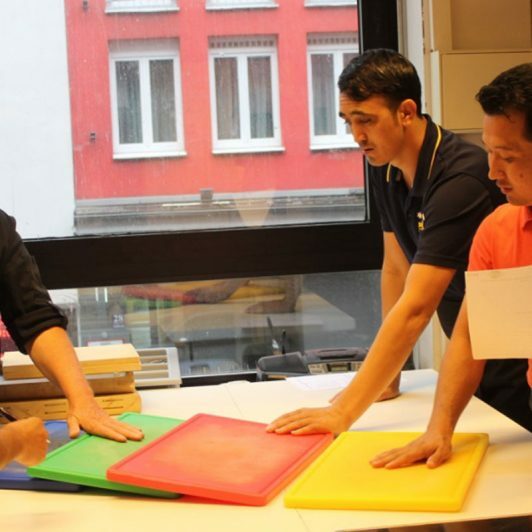 Through a mixture of hands - on training and mentoring, the Turning Tables team is doing an excellent job in motivating and empowering young refugees to develop their skills and find job opportunities.